United Utilities have provided paths around the reservoirs which are accessible to people using wheelchairs and those with young families in buggies, but we are always keen to find ways to encourage and enable as many of our visitors are possible to explore routes off the main trails and experience more of the reserve and the wildlife that calls it home. We have worked with Experience Community in Huddersfield and our own Reserves Area Manager to look at accessibility and come up with some ideas for improvements. Following this we have recently received planning permission to improve the path surface from Ashway Gap picnic area, leading to the old Rhododendron Alley, then down to the adjacent Pennyworth Plantation. 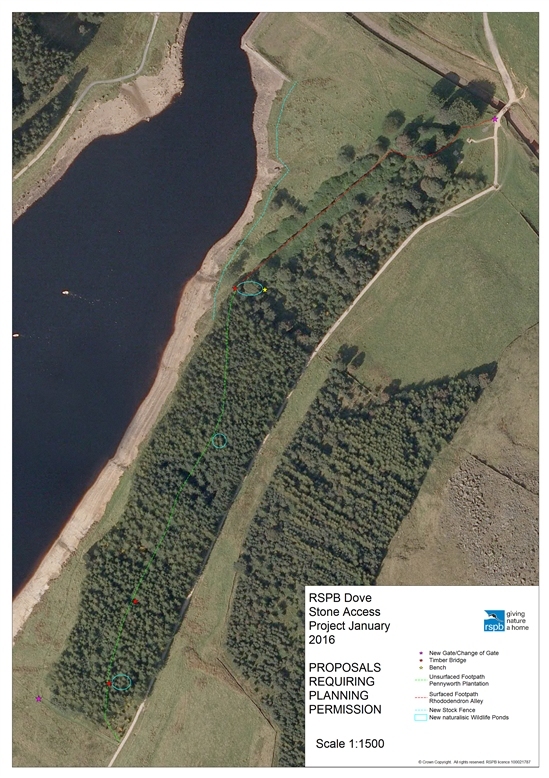 This will allow wheelchair and buggy access through an area of the site that is well used by some but hard for others to access, giving lovely views out across the reservoir - currently denied to those who can't walk down there. Our wonderful local volunteers are working to create a path through the Pennyworth Plantation, which will include felling some of the conifers and replacing them with native trees (like oak, rowan, downy birch, elder, hawthorn and common alder), creating wildlife ponds, bridges over the ditches and planting wildflowers, to allow more people to access and enjoy the woodland habitat and to open up our volunteering opportunities. While the paths at Ashway Gap will be resurfaced (as they follow the line of original paths associated with the old house), the path through the wood will be a more natural, un-surfaced path but compacted, wide enough for a wheelchair and will have passing places. It will be ideal for those who have the mindset and equipment to enjoy a different challenge - an 'adventure grade' path to provide a fuller and more enjoyable experience to more people. We are also planning to extend the path to the viewpoint at Binn Green and make it easier for people to get close to the bird feeding area. We hope people like these ideas but are keen to hear what you think. Do you think it's a good idea to make Dove Stone more accessible for people using wheelchairs and/or with young children in pushchairs? If we create a new path through the woods, with ponds and wildflowers would you and/or your family be keen to explore it? Many thanks for your feedback Berenice!